LESSON 7: Close to 0, 1/2, or 1? LESSON 12: Birthday Cake Fractions! How much cake is left? SWBAT identify fractions when the whole (region) and a part of the region are given and understand numerator and denominator. In this hands on lesson, students explore fractional relationships using pattern blocks in order to build conceptual understanding of numerator and denominator. The most important thing to be learned from my number hooks and magic tricks is that students will pick up and explore material that interests them. 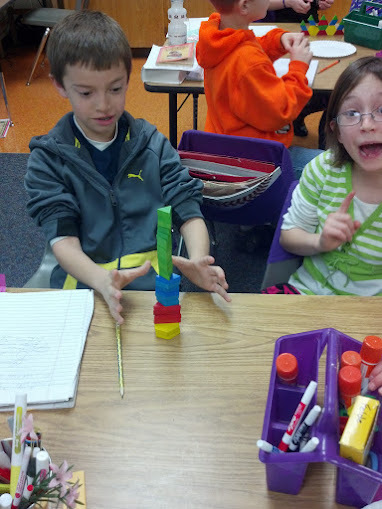 Magic is a fabulous and fun way of making math come alive for my students. It allows for a true inquiry environment for learning. I start this warm up using this number trick with multiples of 9. My students have seen a very similar trick to this before. They love it. So far, none of my students have figured out exactly how it works, but some are getting very close. The magic of nines is captivating for students and adults. For more information about nines, you can look up "casting out nines" for other fun math magic tricks. This one is quite simple. For any number, when you add the digits together and then subtract this number from the original number, the result will be a multiple of nine. The gopher trick uses this principal. Every multiple of nine has the same symbol. Students don't notice this because they are concentrating so much on their number. The gopher then guesses the symbol correctly every single time. This lesson is adapted from the illuminations website. My goal for this lesson is that students are able to express in their own words the definition of a numerator and denominator after building fractions with pattern blocks. I begin this lesson by passing a set of pattern blocks to partners. (Only the yellow hexagons, red trapezoids, blue rhombi, and green triangles are needed. Students do not use the orange triangle or the tan rhombus for this lesson.) I give them about 4 hexagons, 18 triangles, 6 rhombi, and 6 trapezoids. I then give them about 5 minutes to "play" with the blocks. I have found from past experience that students needs a few minutes to explore the manipulatives, build with them, touch each one, and basically play and manipulate them on their own terms before they are ready to use the blocks as a learning tool. You can see here how these two are really enjoying their "play" time. After five minutes, students work in pairs to explore fraction relationships. Students use pattern blocks to find relationships and to determine the answer using sheet FunFractions-AS-RegionRelationships2. 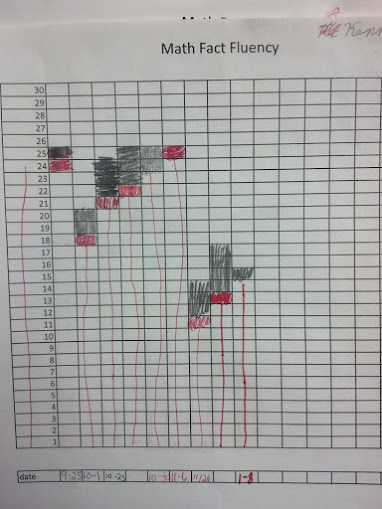 The worksheet guides students by asking questions about the fractional relationship. My students should have little difficulty expressing this relationship as a fraction since they have used the fraction ½ on many occasions even prior to kindergarten. This lesson focuses on the written format and what the numerator and denominator really mean, building students conceptual understanding of fractions. You can see a sample of students' work below. The second column of numbers were from an extension I asked groups to do if they finished early. I asked groups to change the size of the "whole" to two of the shapes, instead of one. It appears that the student is subtracting, but he/she is simply noting that if there were two of each whole, like two rhombi, and still one triangle, the triangle would then represent 1/4 of the whole. 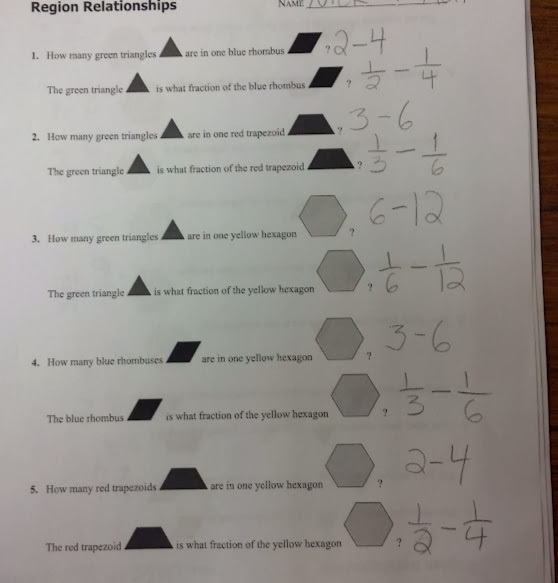 When most students are finished I lead a whole class discussion asking questions like the ones found in this resource - fraction questions pattern blocks. During the discussion I write the fraction as students list the number of parts in the whole. this helps students understanding of where to place the numerator and denominator when writing fractions in standard form. For this wrap up I give my students an exit ticket . On the exit ticket, I instruct my students to describe in their own words what a numerator means and what does a denominator mean? From this exit ticket, I will make small groups for re-teaching. Note: When analyzing the exit tickets, I sorted them into two piles - students that understand both terms and students who do not. After sorting the exit tickets, I had 8 students in the pile of students who did not understand both terms. I think some of those students are close, but not yet where I want them to be in their explanation or communication about these words. This is crucial for students to understand. Many math problems and concepts in the future rely on students understanding numerator and denominator. For example, much later in the spring, students will find 1/6 of 180 degrees when we work with angles - thy must have a solid understanding of denominator in order to be successful.